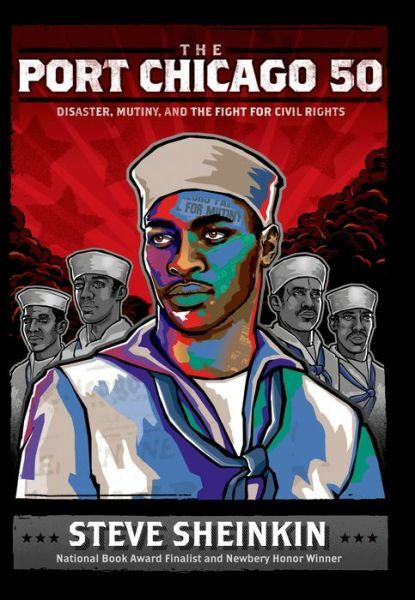 The Port Chicago 50: Disaster, Mutiny, and the Fight for Civil Rights by Steve Sheinkin. Roaring Brook Press (an imprint of Macmillan Publishers), 2014. 208 pages. Publisher recommends for ages 10-14. ISBN: 9781596437968. Steve Sheinkin is a master of narrative nonfiction. He tells real stories with a fine novelist’s or a poet’s sense of what to include to make the story matter to the reader. And his stories are so fast-paced they are hard to put down. All of that is true for The Port Chicago 50. In this book Sheinkin tells the story of a group of black Navy men during World War II. The men were stationed at Port Chicago, east of San Francisco. They loaded ammunition onto ships. They had no training in handling ammunition. Only black Navy men loaded ammunition, not white Navy men. An explosion killed roughly 300 men, injured many others, and sunk two ships. The surviving members of the Port Chicago divisions were moved to Mare Island Naval Base, closer to San Francisco than they had been at Port Chicago. When the divisions were ordered to resume loading ammunition onto ships the 50 refused. They were tried for mutiny. A young Thurgood Marshall was outraged by the racism he saw in the mutiny trial. He pressed the Secretary of the Navy to conduct an investigation. Eleanor Roosevelt also let the Secretary of the Navy know that she was concerned about the outcome of the trial. Sheinkin sets the story of these black enlisted men at Port Chicago within the context of the Civil Rights Movement. Before World War II the US military was segregated. Even the blood supply kept on hand for wounded soldiers was divided into white blood and black blood. At the beginning of the war, the decision was made to continue segregation. Besides that, blacks were only considered capable of jobs in the mess hall or other menial tasks. Loading ammunition was considered a menial task. In 1946, as a direct result of the actions of the Port Chicago 50 and the unfairness of their mutiny trial, the secretary of the Navy ordered the Navy to be desegregated. In 1948 President Truman desegregated all branches of the military. The Port Chicago 50 are not often mentioned when the heroes of the Civil Rights Movement are listed. This book makes it clear that they should be mentioned and they should be honored. The book is full of quotes from the Port Chicago 50 themselves and from the trial transcripts. It’s also full of photos. In the back there are source notes, as well as an extensive bibliography. To see more of my reviews, check out Kid Lit About Politics. Copyright © 2014 Elizabeth Parrott All Rights Reserved. King George: What Was His Problem? 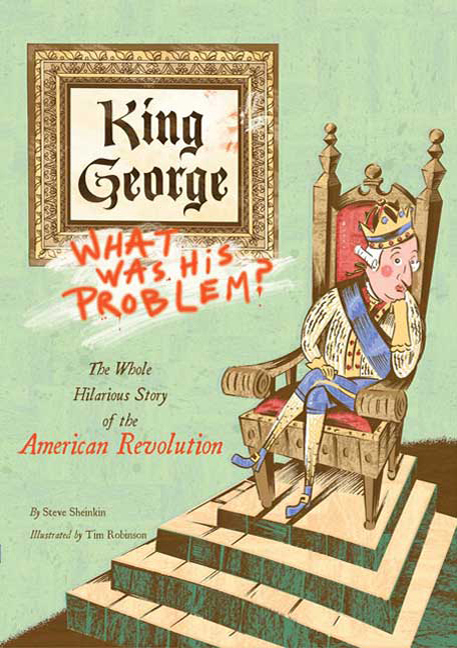 The Whole Hilarious Story of the American Revolution. Written by Steve Sheinkin. Illustrated by Tim Robinson. Square Fish (an imprint of MacMillan Publishers), 2009. 208 pages. Publisher recommends for ages 10 and older. ISBN: 9781596435186. Sheinkin tells the story of the American Revolution in a fun and funny way. He uses anecdotes and stories that don’t make it into history textbooks, for example he writes about the night Benjamin Franklin and John Adams shared a bed. That night Adams wanted to close the window in the room because he was afraid of catching a cold. Franklin told him to leave the window open or they would suffocate and launched into a lecture about what causes colds, a lecture that soon put Adams to sleep. In that story, Franklin and Adams become real people, not just names to memorize. The book is made up of short chapters that cut back and forth between battles in the North and battles in the South. The chapters also cut between the political actions of the American Congress and the war. And we see Benjamin Franklin beseeching the French government to enter the war on behalf of the Americans. We also find out that when Franklin arrived in France the British were afraid he would stretch a chain from Calais to Dover and administer an electric shock to Britain that would be strong enough to overturn the island (this anecdote had me laughing out loud). In the very beginning of the war, at the battle in Lexington, the reader sees both the British commander and the American commander telling their troops not to fire. Yet someone fired. Both sides said it was the other side. “So no one takes credit for ‘the shot heard round the world’ — the first shot of the American Revolution.” Throughout the book Sheinkin includes both the American and the British perspective in this way. The irony of the Declaration of Independence declaring all men are free and endowed with unalienable rights, while many of the signers owned slaves, is addressed in a short chapter. Many, many quotes are used and it’s fun to see who said what. At the back of the book there is extensive reference material. The details keep the narrative moving, but by the end of the book I was impressed by my increased understanding of the timeline of the Revolution. Sheinkin is paying attention to the big picture as well as the details. I had a great time reading this book. I also learned (or maybe re-learned) a great deal about the American Revolution. Read more reviews of mine at Kid Lit About Politics.